If you don’t have a Google business page you can set one up in 10 minutes. Step 1: You need to visit the Google My Business page https://www.google.com/business/ and select the [Get on Google] button, you will be asked to login which you do using your gmail account (you will need a gmail account). Step 2: Use the search box to find your business and claim the page, stating you are authorised to manage that business listing. If Google can’t find your business then click [None of these match – Add your Business]. Step 3: When you create a business page for your accommodation you are asked for your business type. IMPORTANT – As an accommodation owner you should choose [Storefront] as your business type, this provides advantages on Google Maps and Local Search. As you set up your Business page you will be asked if you wish to receive a “verify code” by mail – this enables Google to be sure you are where you say you are. You can continue to create the business page and verify later. Your “verify code” can take 1-2 weeks to arrive in the post. You should take advantage of the verify feature as it gives you more options later. 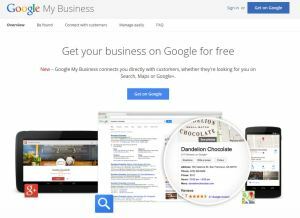 Take the tour of Google My Business and then set up your contact details, location, photos and descriptions, all of which help you thrive on the Google network. It’s as simple as that, you are now Google business ready. Google is constantly looking for new ways to enable customers to book accommodation via their website so watch this space for news of any developments. 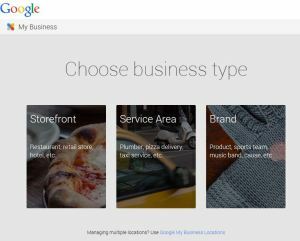 See our earlier blog on the advantages of a Google business page . Don’t forget to add yourself to our Google+ account, our facebook page, twitter or register for our emails. Google business page – why NOW ? I already have a google+ page, so this instructions don’t quite apply…should I be setting up both a google and google+ business page? You should have a Google Business page for a business. I’ve had a Google+ business page for a while now and because we are classed as a hotel there is a ‘Make a reservation’ field. It populates a link to booking.com even though I have not set it to do so. I have tried to get Google local to change this to Freetobook but they are playing dumb. They claim they can’t control what pops up in this section (despite the fact it says ‘booking links are sponsored’ under where it links t booking.com). We’d love to replace this affiliate link with a direct link to freetobook. Have you heard of this before? I have seen this on some Google business pages, I don’t think you can remove it as you say its a sponsored link. We are working on ways for you to share your reviews on your Google page and these will have a freetobook link for booking direct. thanks this would be really helpful As stated previously the booking.com tab pops up wherever we are and taked all the potential direct bookings which should come through freetobook. You can now wshare your reviews on Google Business Page – the reviews have a link to your direct bookings. Goto “Home” TAB and select “Reviews” on the orange bar then select “Social Media” where you can share reviews on Facebook, Twitter and Google.